Today, fourteen years after the massacre of 8,000 Bosnian Muslims in Srebrenica – the worst atrocity in Europe since the end of the Second World War – another 500 coffins will join the thousands buried in the memorial graveyard outside the town. The International Commission on Missing Persons has been carrying out the grim task of identifying remains using DNA and other evidence, allowing relatives to bury their dead and gain "closure". To date, it has identified 6,186 of the massacre's victims. Every year, on the anniversary, the bodies that have been identified in the previous 12 months are laid to rest in a ceremony of painful emotion. After today's funeral, groups of mourners will lay flowers in front of the barn in the nearby village of Kravica where, in the worst single incident of the massacre, more than 1,000 men were tortured and executed in a single afternoon. Though hemmed in by Serbs, the Muslim community of the coal mining town in eastern Bosnia believed itself to be under the protection of about 600 Dutch UN peacekeepers. But when Serbian forces poured into the town in the summer of 1995, under the command of General Ratko Mladic, the Dutch failed to protect their charges. The women and children were crammed into buses and sent away to safety, but over a period of three days the unarmed men, aged from 12 to 77, were systematically murdered. Afterwards their bodies were dumped into rivers and mass graves. 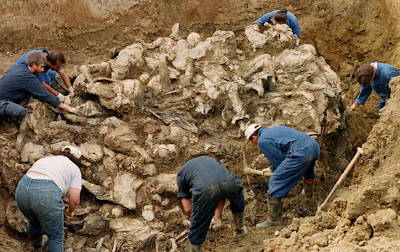 When aerial photos surfaced afterwards, the Serbian army ordered the corpses to be dispersed to secondary and even tertiary grave sites, to hide the carnage. This was done by bulldozers and resulted in bodies being broken up and widely scattered. In one case, the remains of a victim were discovered in four different mass graves, two of which were about 12 miles apart. Srebrenica is Serb-dominated now and ethnic intolerance is a steady undercurrent in the region. The nearby town of Bratunac is said to hold the highest number of unprosecuted war criminals per capita in all of Bosnia. Many of them serve in the local police force. "Bosnia is facing the worst political crisis since the war," political analyst Srecko Latal told Agence France-Presse (AFP). Bosnia is gripped by rising political tensions, with Serbs threatening to secede and some Muslim leaders calling for the abolition of the Serbs' Republika Srpska. "One of the rare encouraging things is that political tensions have not reflected on the relationships between ordinary people," said Latal. But he warned that "might be changing." Bosnia fell into a devastating civil war in 1992 that left 200,000 people dead and displaced millions. So far some 3,200 victims have been buried at a memorial just outside the ill-fated town. Thousands are yet to be exhumed and identified in the area where some 70 mass graves have been uncovered.